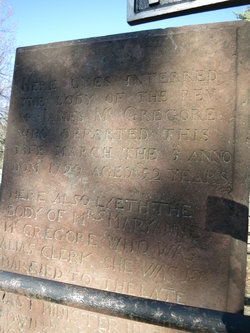 Find A Grave, database and images (https://www.findagrave.com : accessed ), memorial page for Rev James McGregor (1677–5 Mar 1729), Find A Grave Memorial no. 18370093, citing Forest Hill Cemetery, East Derry, Rockingham County, New Hampshire, USA ; Maintained by Robin Parker (contributor 46847861) . your computer for Rev James McGregor memorial. I thought you might like to see a memorial for Rev James McGregor I found on Findagrave.com.